Crewton Ramone's Blog of Math: Fractions And Autism Do In Fact Mix. Fractions And Autism Do In Fact Mix. Here is Sarah really getting the hang of adding fractions...now that we have the idea of it, understand the concepts now it's time to move on to something completely different and wholly unrelated, right? Only if we were in publik skool. NOW it's time to reinforce the concepts and increase the depth of understanding by doing more of the same, only different. 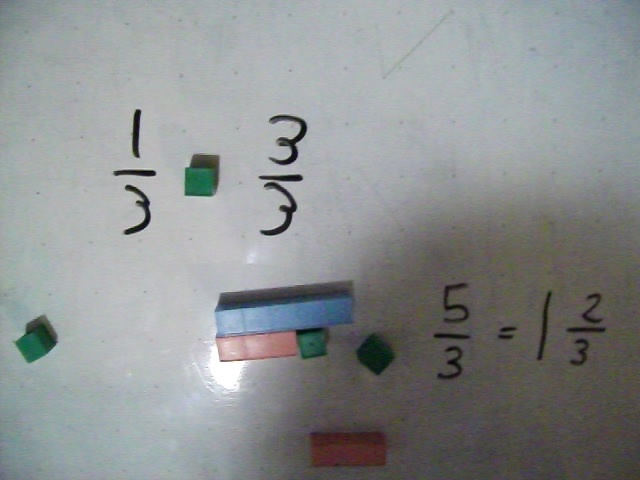 Here we are spending a little time on improper fractions so we know what to do when she "fills up the one." We make a game of it. They are not problems, the attitude is not a chore or drills but see if she can figure it out and how fast. So we do one refresher addition "problem" and then play this game where we rename the pieces and figure how many ones are hiding in there. People are now having the opposite problem used to be there isn't anything about Mortensen Math. Now it's there's so much I don't know where to begin or it's overwhelming. GOOD. Now your excuses have to change. Where to start? Where ever you like but get started. Watch a few vids a week, play, practice, repeat. Here she is doing the whole hour lesson condensed into 17 minutes or so. In the beginning you will note that many symbols are missing when we multiply by one but she understands what they mean. The first review of this series Fractions Despite SPED is here. Want a fractions kit? Get one here.